At the 2016 World Economic Forum edition, in Davos (Switzerland), the Italian Prime Minister Mr Matteo Renzi announced that Italy “should not be a European museum, but its future”. This meant that Italy was ready to further open its stock exchange markets to the world’s financial centres. He argued that Italian economy “deserves to become the leading European one”. Besides the fact that Mr. Renzi had many political reasons to defend the constitutional reforms (connected to his political survival on the Italian Government throne), this new opening and set of proposed reforms has split the wider domestic public. Many of the political analysts were claiming that this referendum was the vote over the Renzi`s stake within the Italian Council of Minister. Wells Fargo Advisory group’s strategic analyst Peter Donisanu, in his brief published several days before the Referendum, claimed that a “no” outcome in Sunday’s vote would have had immediate implications for the Italian banks, and near- to intermediate-term implications for the European Central Bank (ECB) and Italian and Euro area politics. Some of Italy’s largest banks were facing financial difficulty and have looked to the capital markets in an effort to shore up their balance sheets. One such troubled bank, Banca Monte dei Paschi di Siena, is hoping to raise capital by issuing approximately €4 billion (or $4.27 billion) in stock by the end of the year. Such an uncertain outcome could force the bank into a government bailout, “which would require politically unpalatable losses to bond holders”, claims Peter Donisanu. When it comes to the economic and financial affairs, almost the best known event in the last decade surely was the world economic crisis. Its culmination (2008/2009) was the most shocking economic depression which the world has ever seen ever since the great depression occurred by the end of the years 20s of the 20th century. The Euro area has also been hit by the crisis in 2009. All Italian macroeconomic indicators then measured significant downs. The country`s per capita GDP dramatically lowered for more than 5% in 2009, while it recovered in 2010 when the growth of 1.37% was registered. Last year, Italian GDP per capita was in a slightly positive range (+0.73%), while its total GDP expressed in USD was on the same level as of the 2004 ($1.8 trillion). Inflation in 2015 was 0.8%, which remains at the same multiyear level for the previous period. Italy’s new government proposed a 2019 budget with a deficit three times larger than the previous administration’s target, setting up a clash with the European Commission and sparking a sell-off of state bonds. The government offered a budget with a deficit of 2.4 percent of GDP for the next three years. The economy Minister Giovanni Tria’s department forecasts that a 2019 deficit above 1.9 percent would put at risk the containment of Italy’s debt, the highest in Europe after Greece. The European Union demands that Italy progressively cut the fiscal gap to rein in its debt. The EU Economic Commissioner Pierre Moscovici says “We have no interest in a crisis between the Commission and Italy, it is in nobody’s interest because Italy is an important euro zone country. But we don’t have any interest in Italy not respecting the rules and not reducing its debt, which remains explosive.” The 2019 budget will move more than 30 billion euros. 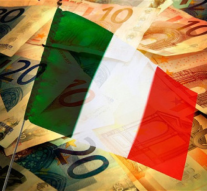 It will set aside 10 billion euros for 5-Star’s flagship policy of a “citizens’ income” of up to 780 euros per month for 6.5 million poor Italians. The coalition is due to deliver Italy’s latest economic growth and public finance targets at the end of the month, before the full budget. Under EU rules, no country should have a budget deficit greater than 3 percent of GDP product or debt above 60 percent of GDP. Italy’s debt amounts to more than 130 percent, the second highest in Europe after Greece, making it vulnerable to market pressure. Economy Minister Giovanni Tria, an academic who is not a member of either of the governing parties, is pushing to keep next year’s deficit below 2 percent of GDP, sources said on Monday. A League source said on Tuesday that Salvini wanted the government to accept a deficit “a bit above” 2 percent. Di Maio said the issue was not broached on Wednesday October 3.